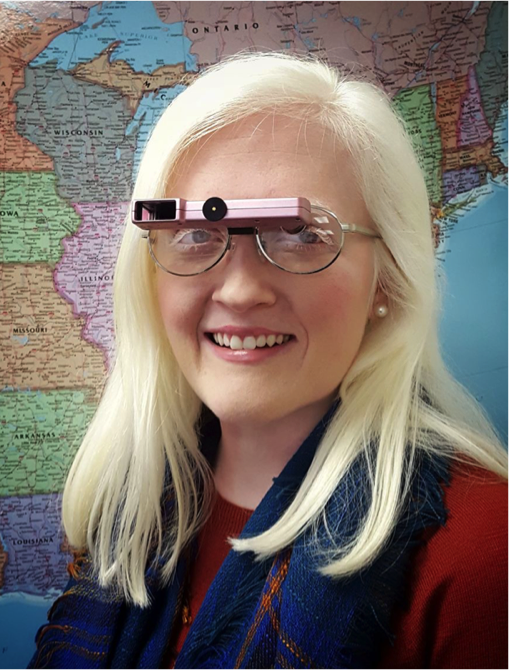 Alyssa wearing her pink Ocutech Sport bioptic telescope. My name is Alyssa. I am 22 years old, and I was born with a genetic condition known as Albinism. This genetic disorder usually causes a lack of pigmentation in the skin, hair, and eyes and is always linked with some degree of visual impairment. I have one of the more severe cases making my uncorrected vision 20/400. This is well beyond the threshold that is considered legally blind which is 20/200. Ocutech, a company co-founded by low-vision optometrist Dr. Henry Greene, has created a line of life-changing, telescopic visual aids known as bioptics made for individuals with particularly low vision like myself. In short, this is a monocular mounted on one’s normal/everyday glasses that enables those with poor distance vision to see objects that are further away more clearly, similar to that of a more normal-sighted person. My parents purchased one of these for me back in 2005 when I was in the fifth grade, and it has been dramatically improving my quality of life ever since. Growing up as a younger child, I struggled heavily with tasks or activities that required any amount of long-distance visual abilities. Trips like visiting the zoo that kids typically enjoy were quite miserable for me because of my inability to see the animals. Normal daily activities such as watching television were a hassle because I always had to sit alone, only a few feet from the television. For this same reason, as I grew school grew increasingly more difficult when we would have to see the board, watch movies, or take notes. For example, when we were taught math, I had to either move a desk right up to the board or go stand at the board in order to see/take notes in the middle of class instruction. I hated this not only because of its inconvenience, but also because I thought it made me stand out in a negative way; I wanted to be like all of my other classmates. Before the bioptics, I did not know what I was missing. When I went to my appointment to get the glasses, I was absolutely amazed! I tried them on, and one of the very first things I noticed was that I was actually able to see others’ faces while being more than a foot away. I could see their eyes as more than just dark depressions in the middle of their face. It was as though I could more deeply connect with people. This brought tears to my mother’s eyes. After we left, I found out I was now able to enjoy many of the activities I could not formerly. I enjoyed going to the zoo or aquarium, going to the movies, watching plays, being able to sit with my family while watching something at home, etcetera. One of the biggest changes after receiving my bioptics at this stage in my life was being able to see the board and take notes from my own seat in class. This provided me so much convenience and enabled me to not feel isolated from my other classmates. I know that school would have become exceedingly more difficult with age, especially when entering college. Without being able to see the board, I am confident I would not have made it to where I am today, so I am deeply thankful for the profound difference this device has made in my life. Until recently, I always assumed that the ability to drive was something that people with low-vision like me would have to live without, and along with that the freedom and independence that driving brings. However, I was recently informed that thanks to the work of Dr. Greene and others, this too is changing. There are now classes offered to train many individuals who use bioptic telescopes with the ability to drive. I cannot wait to see what is in store for me in this area as I have dreamt of being a fully independent adult for years now! This bioptic has brought more joy to my life and enabled me to experience many things that would not have been possible otherwise. They have been one of my greatest blessings, and I could not recommend them more to anyone with low vision wanting to get the most out of what life has to offer.